It’s a pleasure to welcome Albi van Zyl from Dimension Data, which uses a charity called Qhubeka to donate bicycles to people to help them get to schools, clinics, and even jobs. Albi, thanks so much for taking the time to chat to me. So, I briefly introduced Qhubeka but obviously you guys, as Dimension Data, have had a long-term relationship with them. Can you tell us more about that? Qhubeka has been around since 2005, and Dimension Data has been involved with Qhubeka since pretty much their inception. But we’ve become more involved since we became the title sponsor to Team Dimension Data who rides for Qhubeka. So, that is since 2016, and we have multiple angles in which we partner with Qhubeka. So it is for the team, and we do it also as part of our corporate and social responsibility and we get involved with Qhubeka on various angles in any which way we can really. Dimension Data also had an auction earlier this year in which it donated 22 bikes (which were used in the Tour de France) to raise money for Qhubeka in order to help them purchase 487 bicycles. Can you tell us more about that fund-raising effort? Yes, it was a really interesting project. The enthusiasm was fantastic. The auction went very well and we want to thank everyone who supported this great initiative. We’re still wrapping up the auction if you can believe that because of the enthusiasm that we’ve had. Soon, we’ll let the public know exactly how many bicycles were raised and we’ll publish that formally. However, there are other initiatives that we’re still running throughout the year and there’s still more to come. We’ve obviously got a goal with Team Dimension Data to raise money for between 5,000-7,000 bicycles every year. This particular auction will go towards that goal. But with the auction specifically, we still don’t have a final result as to how many bicycles we’ve raised – but we will publish that in due course. 43 members of the Community Policing Forum in Orlando East, Soweto will receive bicycles thanks to @VolkswagenSA. 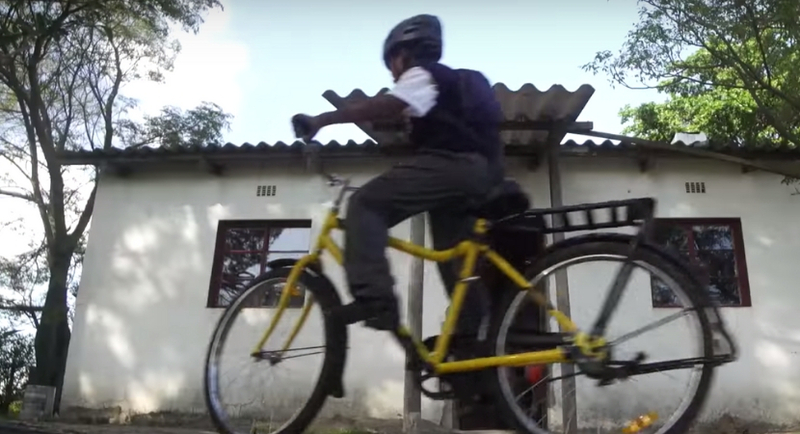 Can you give us an idea of how these bicycles actually make a difference to people on the ground, because a lot of the recipients have previously found themselves walking to school or to clinics? I’d imagine then that something as simple as a bicycle obviously makes a huge difference to their lives? It’s an amazing story. Of 16 million school-going children over 12 million walk to school. And of those, 500,000 kids have to walk over two hours to school and then another two hours back from school. A bicycle reduces about 75% of that travelling time. You know, I have a child that drives to school every day and he tells me how tired he is every day. If only he could imagine how tired a child must be when they have to walk to school for two hours and walk back to school, at the crack of dawn, and then getting home trying to do homework. So, the difference for that child is really impactful – they’re fresher when they get to school. They can concentrate when they’re in the classroom. They actually then have the time to do their homework when they get home from school because they’re not spending it walking back and forth from school. So it makes a significant impact to the child. What’s interesting about how the bicycles affect the community and the family is that a bicycle also becomes a tool for the family to do other things — like the family will use it to go to the local store or to sell some of the produce that they may produce on their smallholding etc. So, the bicycle becomes a tool for the family to uplift themselves and increase their own economic circumstances. Qhubeka is an Nguni word that means ‘moving forward’ and it really is a hand up and not a handout. It’s an earned programme. It’s done through earning it either through cleaning up rubbish or planting trees, and the kids earn the bicycle. So, there’s a lot of pride associated with these bicycles and they’re very proud in the community to be associated with this programme. It is just a fantastic program to be a part of. Can you explain the earning aspect? The kids have to do something for the community in order to receive the bike – is that correct? That’s correct so, as I said, you can either plant trees, which is how it originally started, and then it expanded to cleaning up rubbish. There are other things that you could do such as recycling waste, improving your academic performance etc. Then what they do is they actually build a whole ecosystem around it and Qhubeka make sure that there are trained-up mechanics in the community where they will distribute bicycles. These bicycles are very robust and they’re specifically designed for the road in our African communities. It’s mostly gravelled roads, etc. but they’re also mechanics, which is an entrepreneurial opportunity for somebody in that community to then build a little industry for themselves and it sustains itself. It’s an incredibly self-sustaining ecosystem that then gets developed. Where does this program go from here? Obviously, you’ve had this relationship with Qhubeka for quite some time. Are you going to hold another auction again next year? Is it an annual thing? Yes, I think so. We always find a reason to have another auction or find a reason to raise money for bicycles. For example, some of our staff racing in the Cape Epic*. One of my staff has asked to donate for every stage that he finishes. If you know anything about the Cape Epic it’s quite difficult to finish a stage so amid everybody in Dimension Data (we’re about 6,000 people just in SA alone) are donating towards him finishing every stage. Qhubeka has got the hashtag #bicycleschangeslives – we really do try and spread that word wherever we go. And we ask all our friends and family members to do that too. We ask our clients and our corporates to get involved with Qhubeka wherever they can. It’s not a programme exclusively for Dimension Data. A lot of our other clients, like Mercedes Benz, have become a big partner of Qhubeka. They’ve sponsored the establishment of a factory where some of these bicycles are now being assembled, which has also created jobs for the community. And you know, it’s now a global platform because Team Dimension Data Qhubeka is now available as a charity and visible as a charity to the world. The organisers of the Tour de France have taken on Qhubeka as their official charity, which is an amazing feat for a local born Africa charitable organisation that helps to change the lives of both children and disaster relief adults who have to use these bicycles lives. So, it’s a wonderful story. Albi van Zyl, it’s been a pleasure talking to you and finding out more about this programme and I wish you guys the best of luck with it going forward. Thank you so much Gareth, it was my pleasure. * The Cape Epic concluded on Sunday 24 March 2019.